Forgiveness: letting go of the hope that the past can be anything other than what it was. What do we hope to gain from holding on to past hurts? Who is really the one being punished? There is a deep understanding that we are the one being punished when we choose not to forgive somebody. Yet interestingly enough, it can still be a challenge to step fully into forgiveness. Forgiveness brings love to both parties involved. When we offer forgiveness, we bless the other person for who they are, not the words or actions chosen. In the process, we bless our own selves by releasing the perceived wrongdoing and step into love and grace. I have found in my experiences that the closer the other person is the more challenging forgiveness can be. There are unspoken, subconscious expectations set upon those closest to us. The degree of deviation from the expectation is directly proportionate to the difficulty of offering forgiveness…to ego…the fear-based pilot within. As I work through the forgiveness process, I am faced with a variety of perspectives. I see how the past has shaped and influenced the other, yet that doesn’t make the behavior “ok.” I understand the fear involved, but I struggle to accept the disconnect between us. I feel the depth of “stuckness” within me yet ego mind doesn’t accept me doing the work of forgiveness and allowing the other to get a “free pass”. If the awareness of the “misstep” is missing, how can trust be re-established? The resistance to forgiving is all based in fear…my own fear response to the situation and the implications of it. The connection I most seek within the relationship will continually be blocked until I make my way through forgiveness. Am I being my best self in this moment of resistance? Am I seeking to blame or bless? Is there really any moral high ground to stand on if I choose to continue to hang on to the hurt? So what is there to prove? Acceptance of human nature and the stories we carry. Forgiveness blesses us with the courageous vulnerability of self-love. Not only does forgiveness allow for grace to enter in, but it reinforces the fact that words hurt if we choose to let them. Words do not have the power to physically destroy us. Words may sting in the moment, but we have the choice in determining how long the sting will last. Another element is self-forgiveness: for hanging onto it for so long, doubting the truth of who we are, allowing someone else’s pain to determine our worthiness and closing our hearts to love. 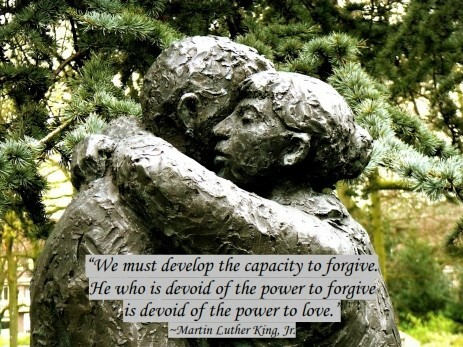 This, of course, only addresses one aspect of forgiveness. Regardless, the fundamental concept remains consistent. We hand over our sense of worthiness when we choose not to forgive.